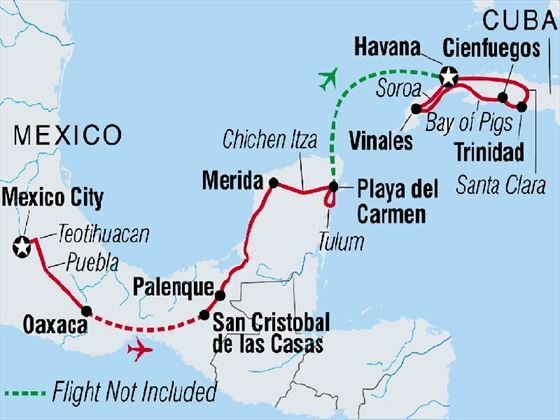 Experience the best of Mexico and Cuba on this 21-night journey and see the sights in comfort. You’ll discover the culture and stunning landscapes of these fascinating countries, full of vibrant beauty and fiery flavours. Culture enthusiasts will love the Maya history at the awe-inspiring ruins of Chichen Itza and the opportunity to visit traditional communities in charming San Cristobal de las Casas. Food lovers will be in heaven feasting on delicious local food, with the opportunity to learn some new cooking skills. Explore Mexico City, stroll among the ancient Zapotec ruins of Monte Alban and learn to salsa. You’ll wander through Havana’s fascinating colonial streets with crumbling but still beautiful architecture and breath in clear mountain air in Soroa’s mountain orchards. Trinidad is Cuba’s best preserved colonial town and like Havana seems to have been frozen in time, with a unique mix of 1850’s architecture and 1950’s cars. From Mayan ruins to crumbling facades, vintage cars, hand rolled cigars, salsa and mariachi - this trip has it all (INT - QVKGC). After arriving at Mexico City’s Benito Juarez International Airport, you’ll be transferred to your hotel. There will be a Welcome Meeting at 7pm, where you’ll get to know you group leader and fellow travellers. If time is permitting, why not take a stroll to explore a bit of vibrant Mexico City where old meets new in this capital city? Following your Welcome Meeting there will be an optional group dinner at a nearby restaurant. On your first morning in Mexico City, you’ll enjoy a guided city tour to visit the Metropolitan Cathedral, Zocalo, National Palace and Museum of Anthropology. The rest of the day is free to do as you please. Why not pop along to La Casa Azul (Frida Kahlo Museum) for an insight into this popular Mexican artist? Grab an Uber taxi from your hotel to the museum, which should only cost about £6.00. Or, just one kilometre from your hotel you can listen to your own Mariachi band at the Plaza Garibaldi. 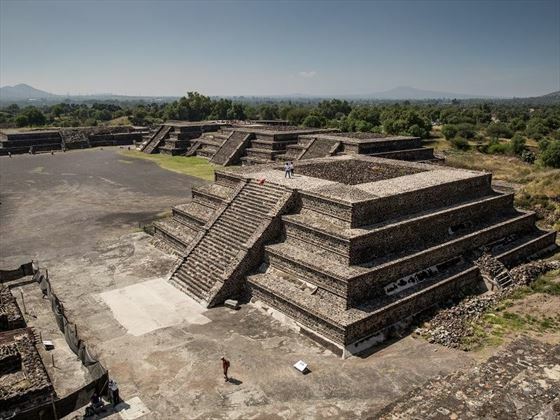 This morning you’ll be visiting Teotihuacan, about 50 kilometres northeast of Mexico City. 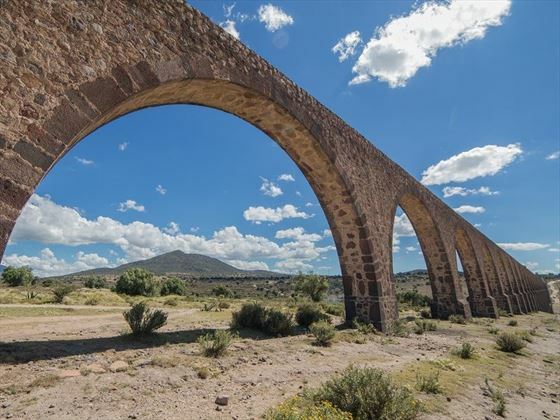 You'll explore the towering Aztec ruins known as the Pyramid of the Sun and the Pyramid of the Moon. Wander along the morbidly named ‘The Avenue of the Dead’ to discover what life was like here nearly 2,000 years ago. Today you’ll be driven by private vehicle to Oaxaca with a stop at the town of Puebla, full of colonial heritage. Stroll through the local markets and admire the hand painted tiles. 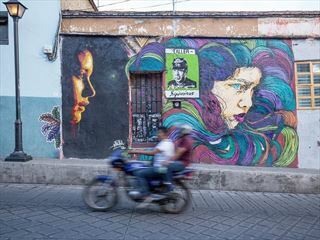 You’ll arrive next in Oaxaca, a stunning colonial city with a renowned food art and art scene. You can walk through the laid-back streets and browse for traditional Mexican handicrafts such as colourful woven blankets and shawls. Or, sample some regional cuisine, like tasty banana-leaf-wrapped ‘tomales’ or spicy baked chilli and lime grasshoppers. You’ll go on a city tour of Oaxaca today, with a visit to Santo Domingo Church, Zocalo, and local art and craft galleries. Enjoy lunch in the vibrant 20 de Noviembre market and peruse the local eateries, like the famous grilled meats hall. In the afternoon you’ll set off for the nearby village of Teotitlán del Valle to visit a weaving workshop and watch colourful rugs being made. The day will end at an artisanal mescaleria to sample some of the area’s best mescal. Salud! 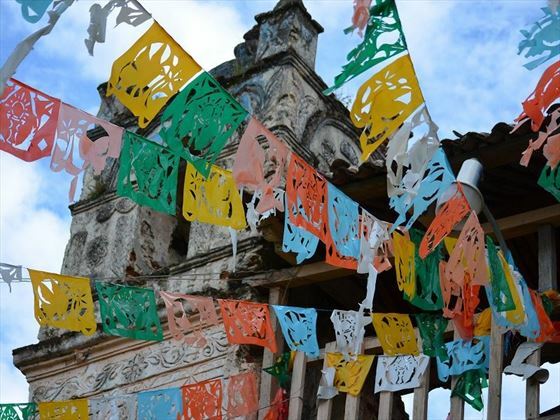 Your day is free day to explore Oaxaca at your own pace. You could visit the archaeological site of Monte Alban, first inhabited by the Zapotec civilisation around 200 BC. There are amazing views from this point, across the three legs of the valley of Oaxaca. Or, drop by at the Santo Domingo Cultural Centre - a lovely museum in a renovated cloister next to the Cathedral with excellent exhibits. Today you’ll fly from Oaxaca to Tuxla Gutierrez and then drive for 1.5 hours to San Cristobal de las Casas. Once in your destination, you can take a walk through the winding cobbled streets to absorb its old-world charms and Spanish colonial architecture. If time allows, why not visit Sumidero Canyon, an impressive 800-metre-deep canyon carved out by the Sumidero River? This morning, you’ll enjoy a fascinating tour of the Mayan villages of San Juan Chamula and Zinacantan and see the people in these Mayan communities in their distinctive, colourful clothes. The rest of your day is free to explore SanCris at leisure. Perhaps visit the fascinating Na Bolom Museum, which was the home of anthropologist and photographer Gertrude Duby-Blom and her archaeologist husband Frans Blom? Or, admire the amber (jade) museum, selling beautifully carved items and insect-embedded pieces. Saying farewell to San Cristobal de Las Casas, head next to Palenque. Stop by at Misol-ha, a gushing waterfall plunging into the pool below. Later, you’ll visit Agua Azul, which flows slowly over limestone rocks and where you can have a refreshing afternoon dip and a leisurely stroll to enjoy the beautiful scenery. There will be time to explore Palenque, at your own leisure later today. After an early start, you’ll make tracks for the archaeological site of Palenque. Situated atop a hill in the jungle, you’ll witness amazing Mayan ruins dating back as far as AD 600. There are still many unexcavated ruins hidden in the depths of the forest. Listen out for howler monkeys on your guided exploration through the jungle. By early afternoon you’ll be on the road for an eight-hour drive to Merida. After breakfast, you’ll head to the coast to pick up a boat for the Celestun Bird Sanctuary and Biosphere Reserve. Journey time is 1.5-hours and there are long stretches of beaches framed by coconut trees, with a variety of sea birds. Between November to March, it’s possible to see thousands of flamingos – a magnificent splash of pink on the landscape. This afternoon, you’re free to explore Merida. See the impressive Regional Anthropology Museum of the Yucatan, or take a city stroll and seek out art and culture hot spots. 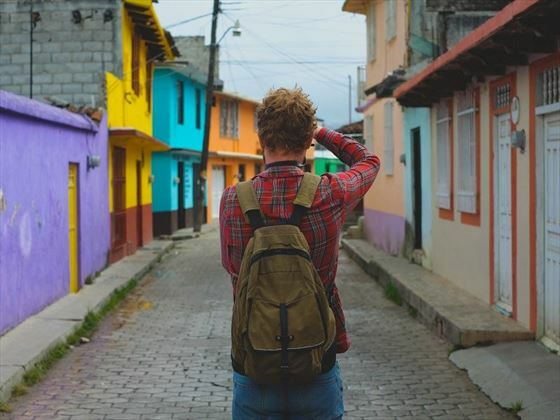 Perhaps go for a walk along the mansion-lined Paseo de Montejo and visit the outdoor market which sells hammocks, Mayan replicas and delicious local cuisine. Why not try some cochinita pibil ('little pig') or if you’re feeling brave, some spicy El Yucateco hot sauce? Or, check out the ancient ruins of Uxmal. The most famous Mayan site in Mexico, no trip to Mexico would be complete without a visit to Chichen Itza. You'll see the marvellous Temple of Kukulkan, The ‘ball court’ and much more. It can get very hot here, so a hat and plenty of water is recommended. After your incredible guided tour, set off for the resort town of Playa del Carmen. Today you’ll explore the wonderful Yucatan Peninsula. 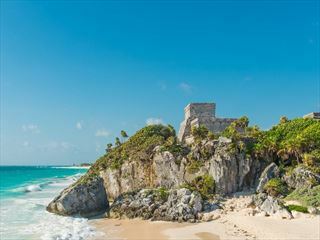 The ruins of Tulum are only an hour away and a little cooler as they’re on the coast, with the cliff top ruins overlooking a white sandy beach. Heading back to Playa del Carman, stop at a hidden cenote for a dip you’ll never forget. Climb down into the stunning natural sinkhole, filled with crystal clear fresh water and jungle foliage draping atmospherically into the cenote. Chill out and relax on your free day in the Riviera Maya. Sip a Margarita and continue to exlore the area. Today, you’ll be saying farewell to Mexico and heading to Cuba. There will be a complimentary transfer to Cancun Airport and on arrival in Havana. The welcome meeting is at 6pm followed by an optional group dinner. Overnight: Premium Guesthouse. Breakfast is included. 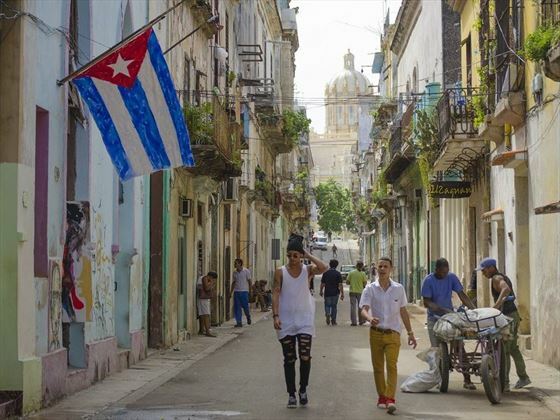 The best way to enjoy Old Havana is on a walking tour. You’ll see the cathedral, Plaza de Armas, San Francisco de Asis, Plaza Vieja and Central Park. Later today, drive to Soroa, nestled in a beautiful valley and enjoy lunch and a tour of the orchid garden. 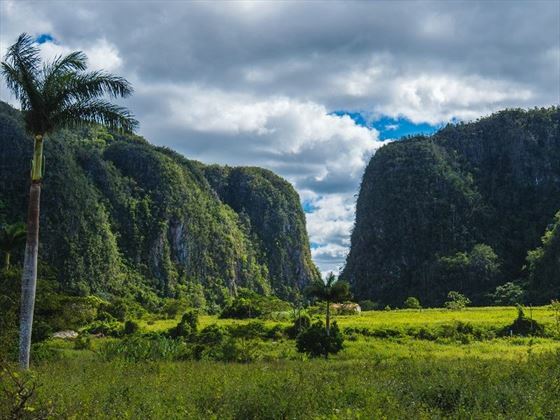 Next is lovely Vinales, with tobacco and agricultural fields and some of the prettiest scenery in Cuba. Here you can cycle or walking through tobacco fields and hike to mountain caves (all optional activities). Overnight: Standard Guesthouse. Breakfast and lunch included. Stride out on a walking tour of the farmlands to discover a simpler way of life. 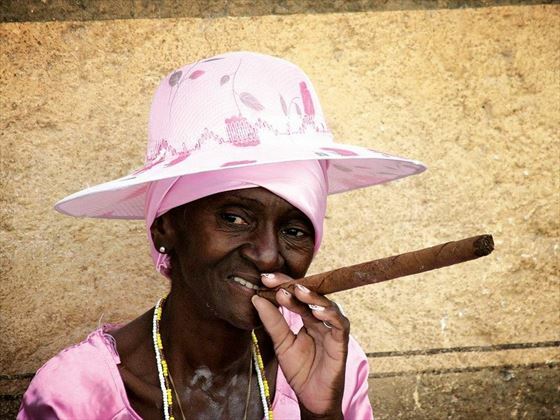 You’ll witness first-hand the farmers growing tobacco for Cuba’s iconic and expensive cigars. Mingle and chat with friendly locals in this charming rural village. Cubans’ love to drink rum and dance until dawn, so today you’ll be getting an informal salsa lesson. Tonight, there’s an included dinner at an ecological farm. Overnight: Standard Guesthouse. Breakfast and dinner included. Making your way towards Cienfuegos, there’s lots of travelling today. The first stop is at the Bay of Pigs. 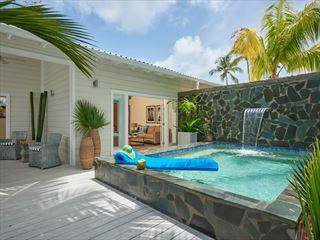 - swim in the crystal-clear water and soak up the scenery. A short drive will bring you to the seaside town of Cienfuegos where you’ll spend the night. There will be a photo stop at Palacio del Valle - Cienfuegos' architectural pride and joy. Why not try some Cuban coffee while you're here – typically served black, strong and very sweet? Overnight: Premium Guesthouse. Breakfast and lunch included. After breakfast you’ll take a short bus ride to Trinidad. Photo opportunities abound in this evocative town. Wander around and watch the locals puff on huge cigars and see lovingly cared for old Chevrolets. The cobbled streets and colonial architecture add to the allure of this UNESCO World Heritage town. Overnight: Premium Guesthouse. Breakfast included. Your day is free to enjoy Trinidad at leisure. From Spanish-style churches, the nearby Valle de los Ingenios, with sugar plantations and the white sand beach at Playa Ancon. Why not go cycling or hiking to explore further afield? Bikes tend to be a bit vintage, so be careful on the cobbled roads. Overnight: Premium Guesthouse. Breakfast and dinner included. Heading back to Havana, stop at Santa Clara to visit the Che Guevara mausoleum and memorial to see fascinating display of items about the revolutionary leader. Arriving in Havana, stop at Revolution square before the final night of your tour. Perhaps go out as a group and show off your new Salsa skills? Your tour ends after breakfast and the check-out time from your hotel is 10 am. Mexico City: Cathedrals, museums, Teotihuacan. Puebla: Visit Puebla. Oaxaca: City tour, Mezcaleria, Teotitlan. San Cristobal de las Casas: Mayan villages Palenque: Misol-Ha and Agua Azul waterfalls. Merida: Celestun Bird Sanctuary. Tulum: Tulum Ruins. Playa del Carmen: Cenote (sinkhole). Havana: Walking tour. Soroa: Orchid gardens. Vinales: Valley walking tour, Salsa lesson. Bay of Pigs: Visit and swim. Cienfuegos: Orientation walk, Palacio del Valle. Trinidad: Orientation walk. Santa Clara: Che Guevara Mausoleum and Museum. Havana: Plaza de la Revolucion. Please note that the minimum age for this tour is 15 years old.